Are you asking based on looks? Clean it. Lack of electrical? Test it like CaBaRet said. 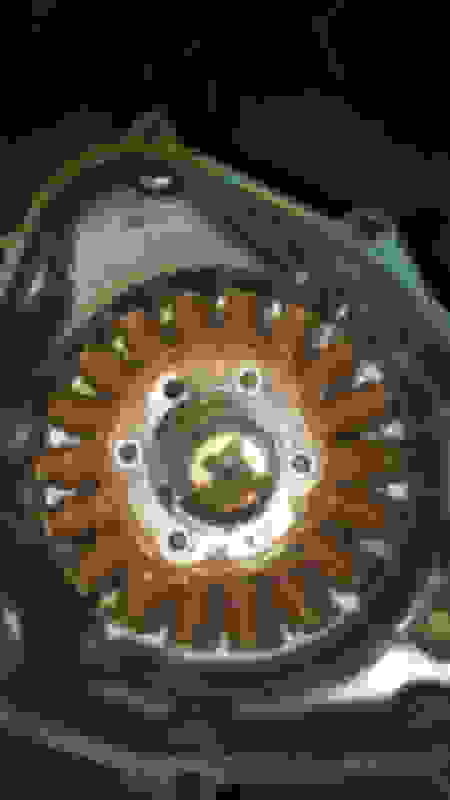 if your bike is cranking, but not firing, then why are you looking at the stator? do you have spark? are you getting fuel to the cylinders? im wanting to know how you got to where you're at, troubleshooting wise. cant do too much to help with the info that you've given but im gonna try to get you headed in the right direction. aside from the spark plugs, you've leaned toward the charging system(stator and rectifier). neither of which, if bad, will prevent the bike from starting, assuming the battery isnt dead, but if dead then the bike wouldnt crank at all so im confident that you're charging system isnt the issue. all that really leaves is fuel and spark. plenty of videos on youtube on how to check for spark, if you dont know already. really easy to do. as for fuel, pull a spark plug, if its wet and smells like gas...then that cylinder is more than likely getting fuel(do this while checking for spark). if its dry, make sure the fuel line isnt pinched. make sure the fuel pump primes when you turn on the ignition(you'll be able to easily hear it). if both are fine then you may have clogged injectors, has the bike sat for a long period of time? Has it sat for a long period of time? dead, but if dead then the bike wouldnt crank at a ll so im confident that you're charging system isnt the issue. well I’ll give you the full story. The bike was in an accident, and had only front end damage. I went to pick the bike up from the towing guys and noticed they had it laying on its side. So anyways I take it home and try starting it up. It took a few tries but after like 2 or 3 cranks it picked up a sparked and stayed on. I took it out for a ride in my front street to see how it ran and it was fine. I put it away for the night and yadayada. So next day I went to start it up and this time it started right up no delays or anything. Then I put it back away for the day/night. Then the next day I tried to start it and the battery had died. So I picked up a battery charger and charged it completely. Put the batter back and tried to start it but it would just crank and not catch. The tank is full with gas and the tip sensor is upright. All the fuses are alright , turn signals, horn and so on. Although I don’t have headlights anymore(they fell victim to the accident) but as of right now I don’t know what to do. The previous guy before didn’t take much care of the bike but when I got it from him before the accident everything was working fine. I haven’t been able to check the spark plugs yet because I don’t have or don’t know the socket size I need for taking out the plugs. And that’s where I am right now.